Submitted Photo McBride donates blood for the 100th time with family support. BEAVERCREEK — Family members gathered around Beavercreek donor Don McBride to honor his milestone 100th lifetime donation at the Dayton Community Blood Center. For McBride, it was fitting way to celebrate blood donations as a special gift to families everywhere on June 8, including the McBride family. “They called and told me it was a big day, and I figured I’d bring them all here,” Don said as his family smiled for photos during Don’s milestone donation. He was joined by his wife Sally, his daughter Megan Behr and his three grandchildren: nine-year old Adi, seven-year old Landon, and at age three the youngest, Eli. He was a blood donor long before Eli was born. The effort to help that student became a challenge to Don. McBride remembered that first donation for a child in need when his daughter Megan gave birth to his grandson Eli. Eli was all smiles watching his grandfather reach his donation milestone. For Don, his motivation for each donation has remained unchanged. 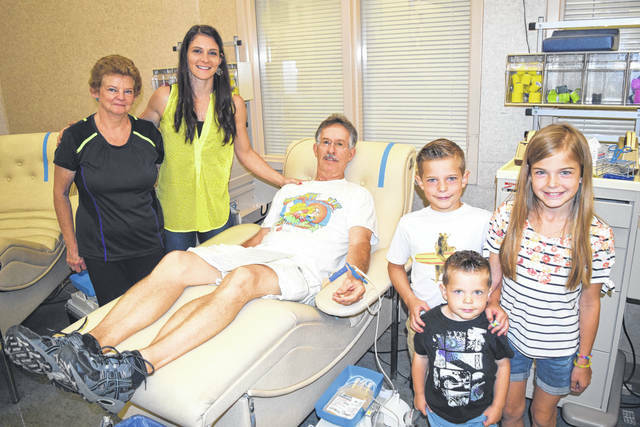 https://www.beavercreeknewscurrent.com/wp-content/uploads/sites/49/2018/06/web1_BCreekDonMcBride-100-LTD-FamilyNEW.jpgSubmitted Photo McBride donates blood for the 100th time with family support.